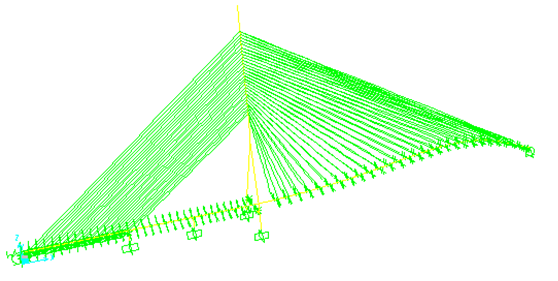 Nonlinear Finite Element Analysis of Rama 8 Cable Stayed Bridge for Health Monitoring System. The Rama VIII Bridge is a cable-stayed bridge crossing the Chao Phraya River in Bangkok, Thailand. 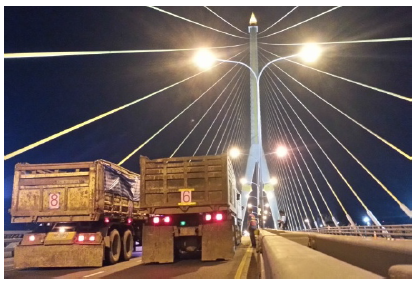 It was conceived to alleviate traffic congestion on the nearby Phra Pinklao Bridge. Construction of the bridge took place from 1999 to 2002. The bridge was opened on 7 May 2002 and inaugurated on 20 September, which is the birth anniversary of the late King Ananda Mahidol (Rama VIII), after whom it is named. The bridge has an asymmetrical design, with a single pylon in an inverted Y shape located on the western bank of the river. Its eighty-four cables are arranged in pairs on the side of the main span and in a single row on the other. The bridge has a main span of 300 metres (980 ft), and was one of the world's largest asymmetrical cable-stayed bridges at the time of its completion. Due to the working period of the bridge is nearly 10 years after the construction, the bridge inspection and health monitoring system including the detailed assessment of the bridge under the normal traffic and seismic hazards are required. For the purposes of detailed assessment of the bridge subjected to earthquake and the new traffic design load (HL-93), the bridge is analyzed using the full 3D finite element analysis. The calibrated FE models consider the effects of construction sequences from As-Built drawings, damages of structural components from the field inspections, the natural periods and mode shapes measured from the field using controlled and ambient vibration tests, the cable forces in the model are adjusted based on the measured cable forces using the nonlinear optimization scheme. The calibrated model is then adopted for nonlinear time history analysis where the series of ground motions are scaled to the new Thailand seismic map (มยผ. 1302) and the existing AASHTO seismic response spectrum curve with 0.1g acceleration level.